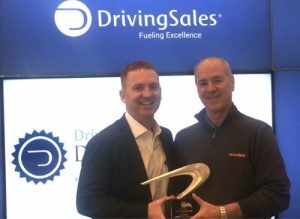 Albany, N.Y. – January 25, 2018 – Auto/Mate Dealership Systems has received a “Top Rated” Dealership Management System (DMS) Award in the ninth annual DrivingSales Dealer Satisfaction Awards, presented at a special event today in conjunction with the 2019 National Automobile Dealers Association (NADA) Convention & Expo. Auto/Mate received a top dealer satisfaction ranking in the DMS category, as determined by the thousands of auto dealers who are part of the DrivingSales.com community. “DrivingSales Vendor Ratings is an important resource for dealers who are looking for help evaluating products and services. This is an important award for us because it’s our goal to always be the number one DMS in customer satisfaction,” said Mike Esposito, president and CEO of Auto/Mate. The DrivingSales Dealer Satisfaction Awards measure dealer satisfaction with vendor products and services, and are based on cumulative ratings tallied and verified over the calendar year (January – December) at DrivingSales.com Vendor Ratings. DrivingSales Vendor Ratings is the industry’s only neutral, comprehensive vendor rating forum featuring real-time peer reviews and honest competitor comparisons, and provides dealerships with important information from actual customers who have hands-on experience using vendor products / solutions in their stores. Each rating is verified as coming from an actual dealership employee. Full award results are available online at http://events.drivingsales.com/dealer-satisfaction-awards/. Award winners are showcased in the 2019 Spring issue of the DrivingSales Dealership Vendor Buyers Guide which, in addition to being distributed at the 2019 NADA Convention and Expo, is delivered to every new car dealership nationwide, as well as to the top 100 used car dealerships. For more information on the DrivingSales Dealership Vendor Buyers Guide, please visit: https://www.drivingsales.com/buyersguide/. For more information about Auto/Mate’s DMS visit Booth #2301S at the NADA Convention & Expo in San Francisco, January 24-26, 2019. Schedule a demo at www.automate.com/nada.